What is the correct amount to tip the itamae (chef)? While there is no hard and fast rule that I have come across, when I sit at the sushi bar I tend to give most of my tip to the itamae and a small portion to the waiter/waitress who serves me my drinks (since I order from the itamae), figuring that the itamae has done most of the work. The actual amount that you decide to tip is entirely up to you. Is sushi on low-carb diets? While sushi itself is not a part of a low-carb diet or lifestyle due to the amount of carbohydrates in the rice, sashimi is perfectly fine since it is only fish without rice or nori. While almost all fish has no carbohydrates or close to none, there are a few items that contain some, such as surimi (imitation crab meat) which is usually found in California rolls. The caloric content of a particular piece of sushi will vary greatly depending on the size of the piece, the part of the fish from which it was cut, and if the fish was marinated or treated in any way prior to serving. Why is shoyu (soy sauce) black? Shoyu (soy sauce) is a ‘fermented’ product, which means that when the soybeans, wheat and salt are combined with water, a starter with mold called ‘koji’ is used to convert some of the sugars into alcohol, in a process somewhat similar to making beer. After a period of time, enzymatic and chemical reactions create a liquid called ‘shoyu’ that has darkened due to oxidation (essentially combining with oxygen). Why does sushi usually come as a pair? The practice of serving sushi in two pieces (ni kan/2 kan) comes from the original edomae-zushi of the 1800’s, the ancestor of today’s nigirizushi. Originally, nigiri-zushi was one large piece, a square. Because it was sometimes difficult to eat, some people began cutting it down the center into 2 pieces. The custom of serving sushi today in a set of two comes from this practice. Why is ginger is served with Sushi? Traditionally, ginger (gari) was served with sushi as it will cleanse the palate when eaten between different kinds of sushi. Ginger also has minor anti-microbial properties and it is thought that eating it with raw food can assist in the prevention of sickness if there is any contamination of the product. Wasabi also exhibits similar characteristics and for that reason, both have stuck as an accompaniment to sushi. Please visit our Sushi and Health section for more detailed information. What is sushi grade fish? Is it safe to eat raw fish that I buy at the market? This is not recommended, it is that it is risky to eat store bought fish as sushi due to the higher potential for parasitic or bacterial contaminants. 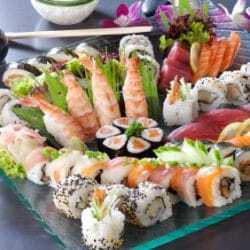 Restaurants have sources that are different from the market, and specifically buy food items that are intended to be eaten raw (commonly referred to as ‘sushi grade’). Fish that you buy at the market is intended to be cooked, and is therefore not treated with the same care as what you eat in a restaurant. Anisakiasis is a particularly nasty and potentially fatal infection caused by microscopic larval worms that live in some marine creatures that can be avoided by thorough cooking, or certain deep freezing techniques. Toxoplasmosis has also been found in some raw seafood. While rare, it is one of the many risks inherent in uncooked foods. While some stores now specifically offer ‘sushi grade’ fish as well as their own sushi bars, it is best not to assume that any fish on display is safe uncooked unless specifically labeled as such. Can I freeze supermarket fish to make it safe? Most fish that is served in restaurants has been ‘flash frozen’ (which can freeze a fish in seconds to extremely cold temperatures) within hours of being harvested, primarily to preserve freshness, but with the added benefit of killing any parasites that the fish may harbor. Unfortunately, your home freezer is not able to freeze a piece of fish as quickly or to as cold a temperature as ‘flash freezing’ and therefore may not kill all parasites. Home freezing also does not deal with other pathogens that might be introduced in the handling process (e.g. bacteria on your counter) and can also have a negative effect the texture and flavor of the fish for for the previously mentioned reasons. It is therefore not an accepted practice to freeze fish from the regular supermarket at home to make it safe for consumption while raw. Is fresh water fish OK to use? Another issue that comes up occasionally is the use of fresh-water fish for making sushi. I offer a resounding “NO.” Fresh-water fish can contain bacteria and parasites that are more prolific or possibly dangerous than salt-water fish. Species such as salmon that spend a large portion of their lives in the ocean are generally considered safe, as well as its permanent denizens, but it is recommended that people not eat fresh-water fish raw due to the increased potential for health risks, some of which can be extremely dangerous. Where do I find more information on purchasing, storing, and handling seafood? While common sense sanitary practices should be paramount, I have come across a few web pages as well: http://www.keithcom.com/kkeith/safety2.html. Where do I find more information on preparation? There are plenty of books available on the subject. There are also Web pages devoted to the topic. Otherwise, see my how to make sushi at home and the preparation guide for more information. Where do I get sushi making supplies? If you are lucky, there is a Japanese food store or two in your area. I recommend browsing your business phone book for the keyword “Japan” or “Japanese” to try to locate a grocer that may supply you with everything. If unsuccessful, check out any international or Asian food market in your area. If still unsuccessful, most larger grocery stores are beginning to sell supplies you’ll need. If that still doesn’t work, you may mail-order rice, nori, wasabi, etc. from a few places on the World Wide Web. What type of rice cooker should I get? A rice cooker is not vital when making sushi at home, but a good one sure does make things easier. See my Rice Cooker page for an article on comparing cookers. Have you any tips on preparing my own sushi? My only real suggestion is practice! When making a ‘maki,’ or cut roll, using half a sheet of nori is the right way to go. I remember using a whole sheet the first time I made maki and I had a really big lip. Very strange. I recently added a large section to this website on how to make sushi at home. This includes instructions as to how to make each different type of sushi as well as a preparation guide and tips for making perfect sushi to make all your sushi come out just right. Where can I buy sushi grade fish and seafood? Catalina Offshore Products has the best sushi grade seafood available, in my opinion. Check them out for almost everything you could ever want. For more detailed ‘how-to” instructions, please visit our How to Make Sushi at Home page. How do I make my sushi rice turn out like it does in the restaurant? When rinsing Japanese rice to get rid of the excess “dust”, wash and rise the water several times until the water becomes almost to completely clear. This may entail rinsing 4-6 times. Next, Japanese rice needs to be cooked at a ratio of 1 to 1.25 cups of rice to water. Usually western rice is a 1 to 1.5 ratio. Also, after it is done, it needs to steep in its own steam for about 10 minutes with the lid on. When cooking Japanese Rice, the lid never comes off until it is done. If your rice is still “gluey and “starchy” you may have added too much water. Next transfer the rice into a large flat container to cool and dry it quickly, then add the sushi seasonings. What if I don’t have a rice cooker? How can I keep the rice from sticking to my hands when making nigiri-zushi? When cooking short grain sushi rice, be careful to measure the water properly or the rice may turn out too soft (and mushy). After cooking, the rice is always left to cool under a wet towel and the rice consistency will even out after resting (if some grains are slightly undercooked) and cooling a bit. When seasoning, use a cutting motion to mix in the vinegar etc, which will help separate the grains without crushing them. The most important piece of the puzzle is that your hands should be moist but not overly wet when shaping the rice bed, which will help prevent the rice from sticking to your hands. With practice, you should be able to get the neta (fish) to stick to the rice, however this will not always happen so don’t feel you are doing it wrong if the neta is just balanced on the rice. The hardest part of the whole process is making sure that the rice is perfect so it will stick together without being too sticky and making preparation difficult. This takes some time to perfect and my advice is to keep practicing and, in time, you will get a feel for it. In Japan, sushi chef’s may train in cooking rice for years before being allowed to prepare the fish, so don’t feel disheartened if you cannot make perfect rice.